Rachel Buff's innovative study of festivals in two American communities launches a substantive inquiry into the nature of citizenship, race, and social power. Drawing on ethnographic fieldwork as well as archival research, Buff compares American Indian powwows in Minneapolis with the West Indian American Day Carnival in New York. She demonstrates the historical, theoretical, and cultural links between two groups who are rarely thought of together and in so doing illuminates our understanding of the meaning of home and citizenship in the post-World War II period. The book also follows the history of federal Indian and immigration policy in this period, tracing the ways that migrant and immigrant identities are created by both national boundaries and transnational cultural memory. In addition to offering fascinating discussions of these lively and colorful festivals, Buff shows that their importance is not just as a form of performance or entertainment, but also as crucial sites for making and remaking meanings about group history and survival. Cultural performances for both groups contain a history of resistance to colonial oppression, but they also change and creatively respond to the experiences of migration and the forces of the global mass-culture industry. Accessible and engaging, Immigration and the Political Economy of Home addresses crucial contemporary issues. 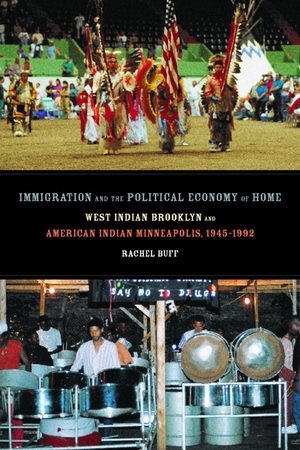 Powwow culture and carnival culture emerge as vital, dynamic sites that are central not only to the formation of American Indian and West Indian identities, but also to the understanding modern America itself: the history of its institution of citizenship, its postwar cities, and the nature of metropolitan culture. Rachel Buff is Assistant Professor in the History Department and the American Culture Studies Program at Bowling Green State University.